About an hour before lunch service was to start, I got a message from my friend telling me that he would be late. Apparently he, too, was flying in this morning... and due to weather conditions the European airport where his flight originated was closed for a few hours. He was now scheduled to land at Narita Airport a little more than half an hour before lunch, and he figured he would be about 40 minutes late to lunch. 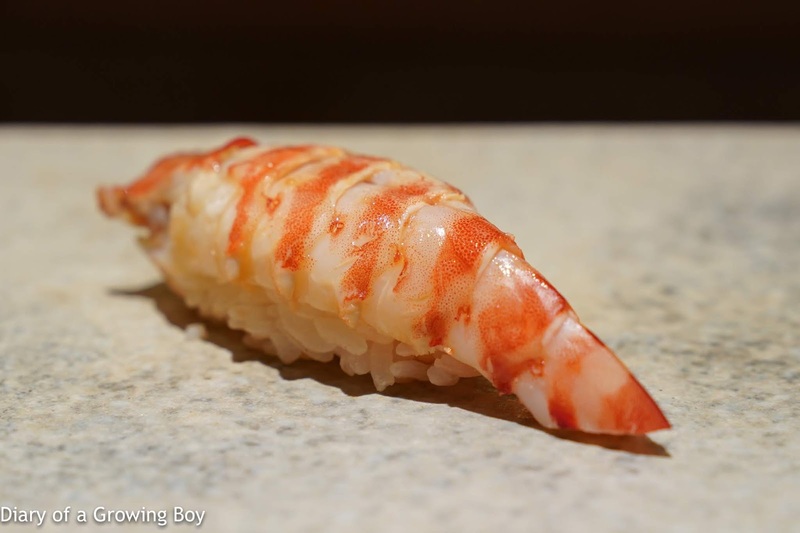 Japanese glass shrimp (白海老) - a very nice way to start our lunch. 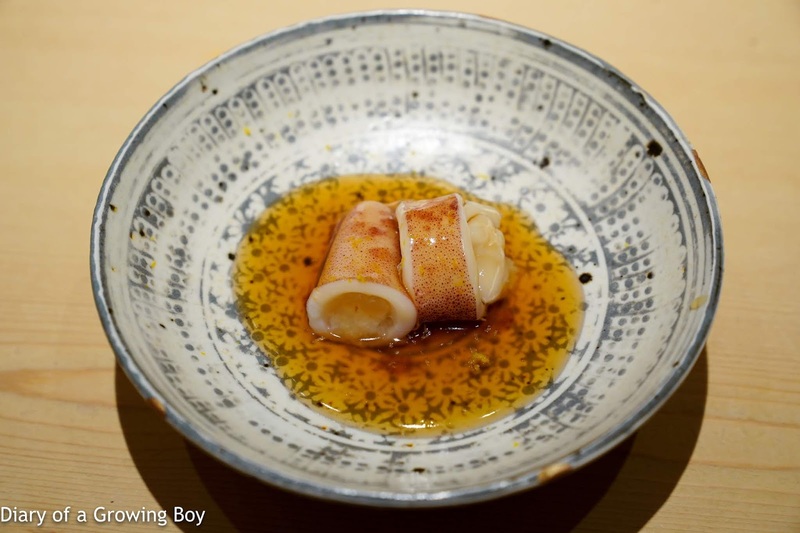 Pregnant spear squid (子持ち槍烏賊) - the spear squid came with crunchy eggs inside, and was served with a tare (たれ) made with brown sugar, soy sauce, and yuzu (柚子). This viscous sauce was so beautiful that, with no spoon in sight, I picked up my plate and drank the sauce. 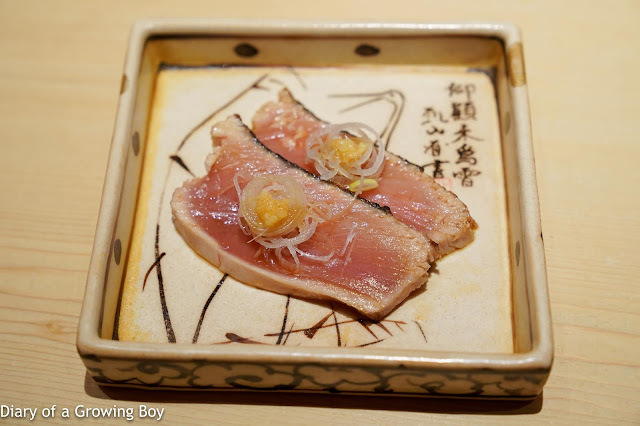 Baby tuna (メジマグロ) - the color here was dark pink, and the fish was done tataki (叩き)-style and torched on the outside, which made the skin crispy with a little smoky flavor. The baby tuna was nice and fatty... and soooo tender in the middle. Lovely and somewhat strong flavors after being marinated in soy sauce, and topped with some white spring onions and minced ginger. Just beautiful. 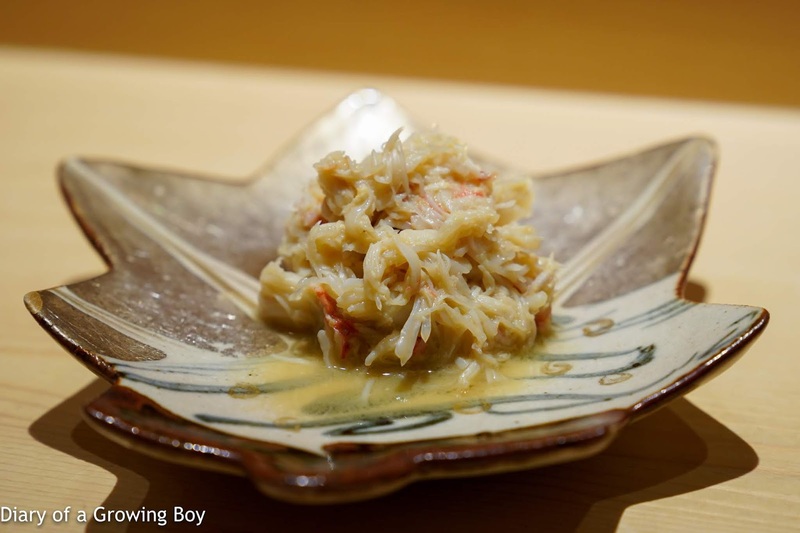 Japanese horsehair crab (毛蟹) - something I've had several times at Sushi Saito Hong Kong. 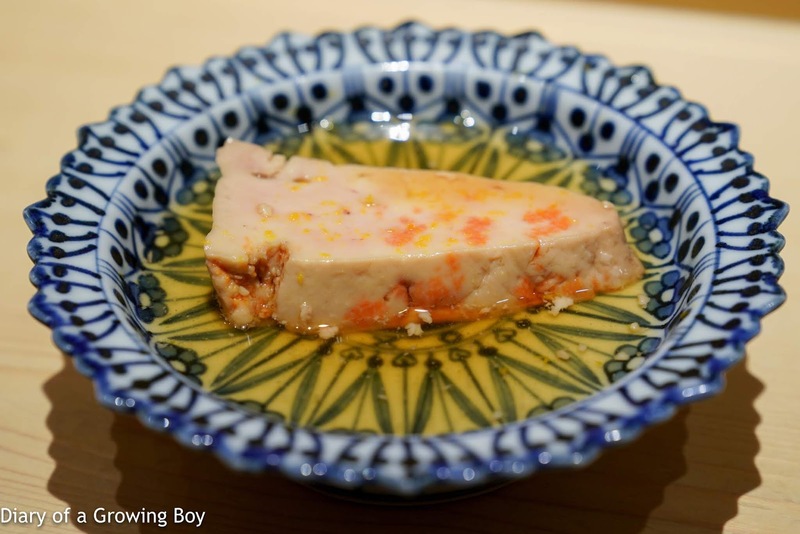 Simmered with sake and a bit of crab tomalley (蟹味噌). Nice and sweet flavors from the crab. Oh I picked up this plate, too, and drank the tomalley-infused sake. 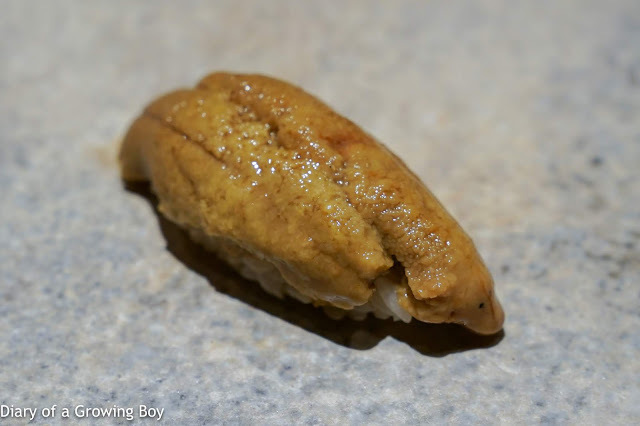 Mackerel bozushi (鯖の棒鮨) - always a treat to eat this, and the mackerel today still got that nice little crunch even though it had been softened up after marinating. Love the nori (のり) wrapper as well as the fragrances from diced spring onions and sesame seeds. Rosy seabass (喉黒) - OMFG. I've had this a few times in Hong Kong and it's always been good, but this... this was on an entirely different level. This was beyond succulent. Taking a bite and putting pressure on it with one's teeth shows that the center of the fish has actually been liquefied... all the juices come out and form a puddle in the mouth. The Japanese have an onomatopoeia to describe something that's light and soft like a cloud : fuwa fuwa (フアフア). That's how I felt eating this amazing piece of fish. Simply stunning. Floored. Speechless. It was, without a doubt, the most beautiful rosy seabass I have ever tasted. So good, in fact, that I was overcome with emotion a split second after taking my first bite. I was on the verge of tears. 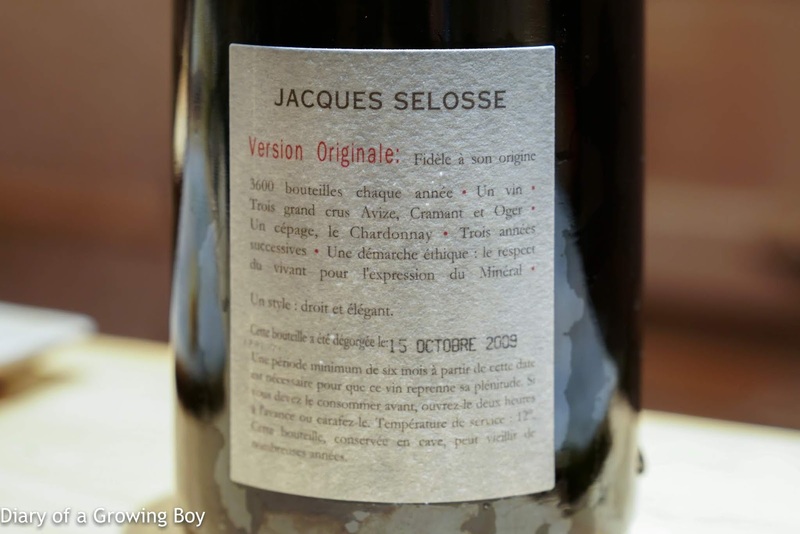 I just couldn't believe something like this existed in the world, and I was lucky enough to be able to taste it. 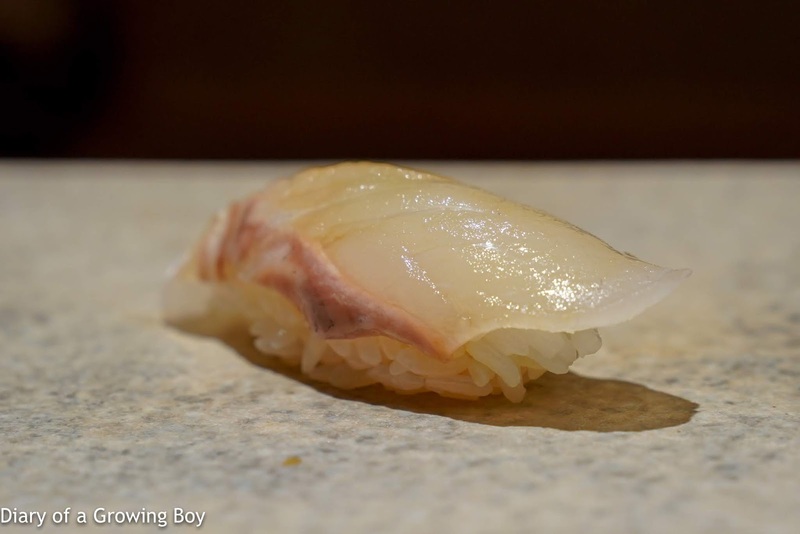 Next was the procession of nigiri sushi. The rice came at a nice and warm temperature, with individual rice grains showing bite. 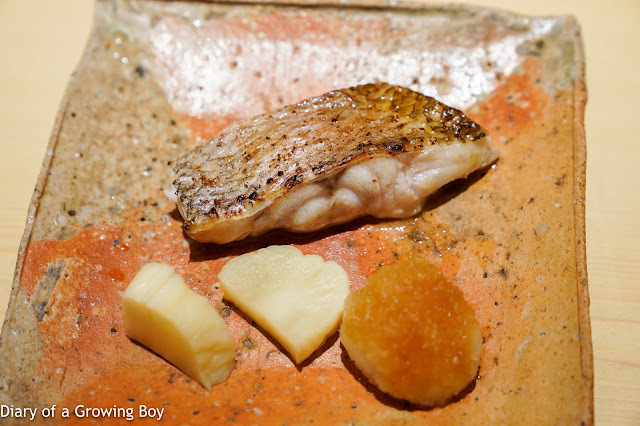 Flounder (鮃) - the neta (ネタ) was chewy and had nice bite, with a little bit of crunch. 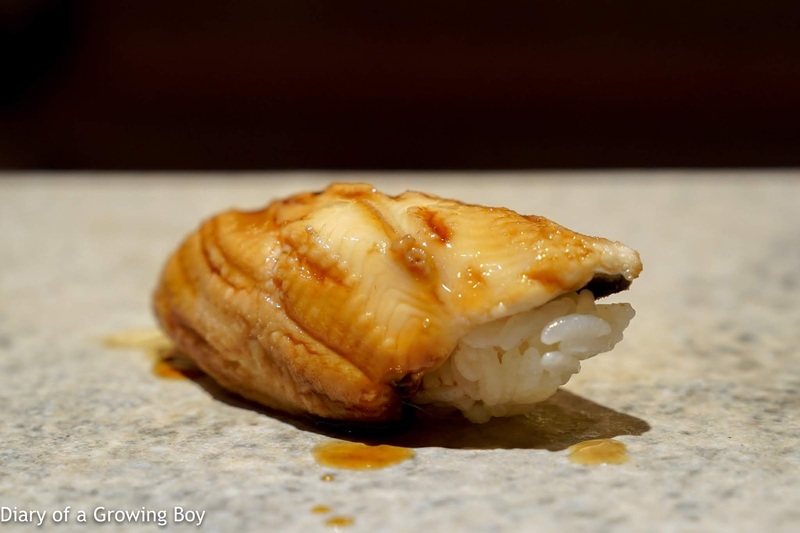 Spanish mackerel (鰆) - this was soooooo tender... and the neta actually started coming apart at the edges. Gizzard shad (小鰭) - good crunch, with pretty strong acidity overall. 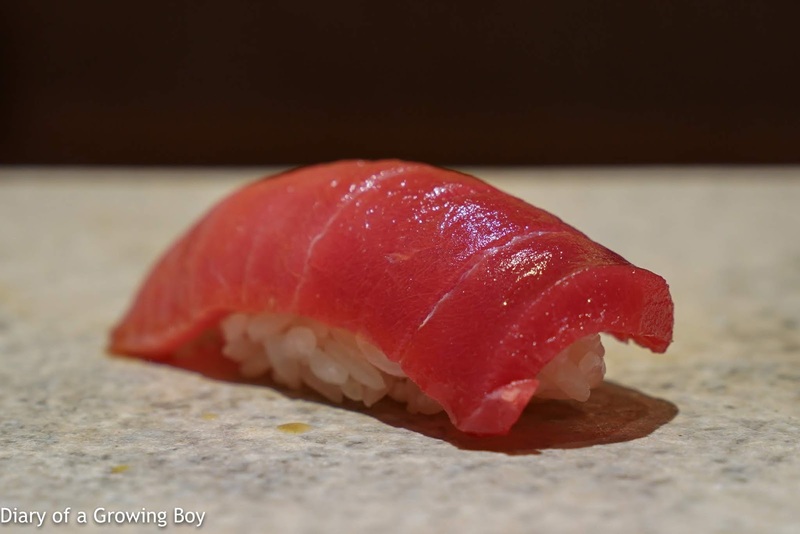 Lean tuna (赤身) - very soft. Lovely texture. 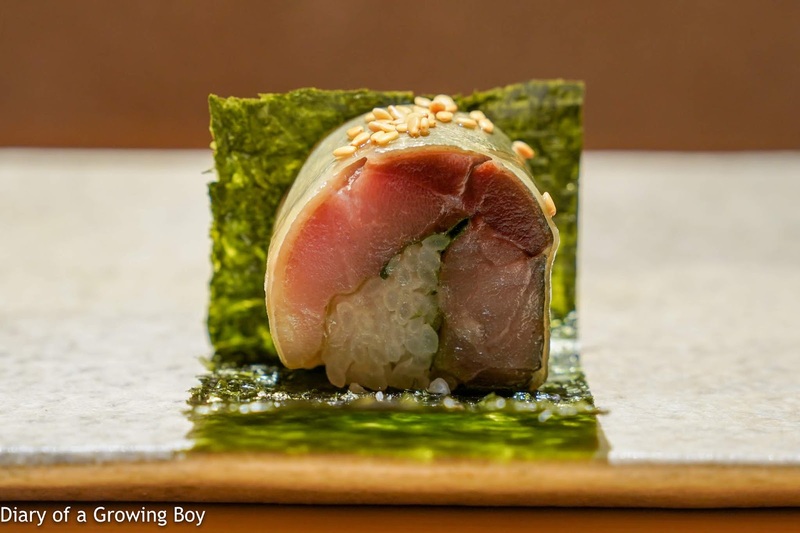 Medium fatty tuna (中トロ) - so soft... like a cushion. 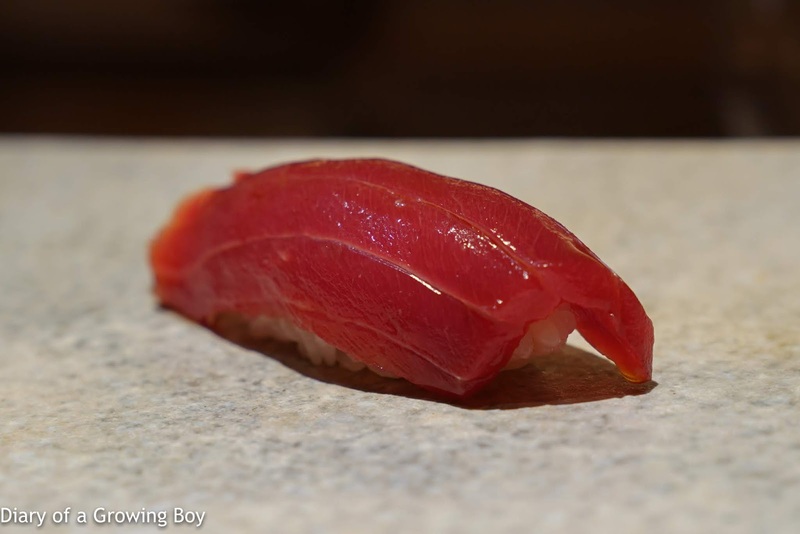 Fatty tuna (大トロ) - the shari (シャリ) was noticeably warm against the cool neta (ネタ). Squid (墨烏賊) - OMG. 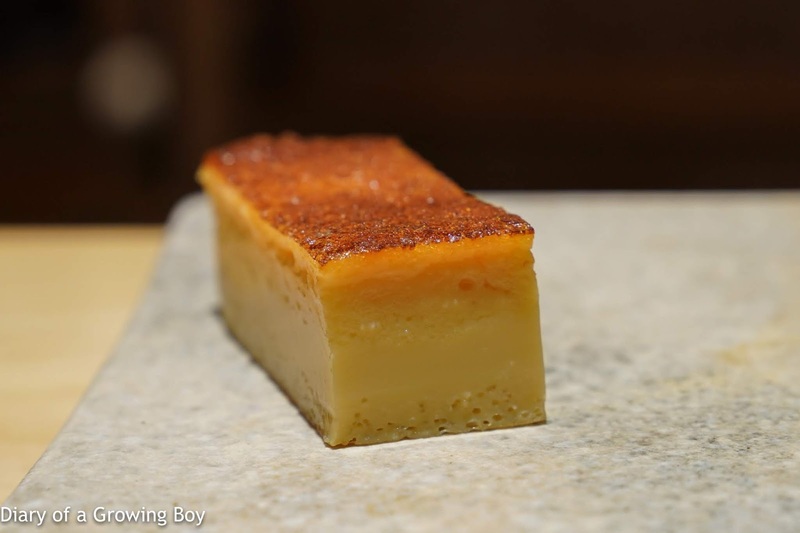 This came in such a thick slice that it must have been at least 1cm thick. Nicely scored to soften the texture, and indeed it was very soft and tender... while still retaining some crunch. It didn't have that partially-liquefied texture that I encountered a couple of times in Hong Kong, though... Seasoned with salt and sudachi (酢橘). 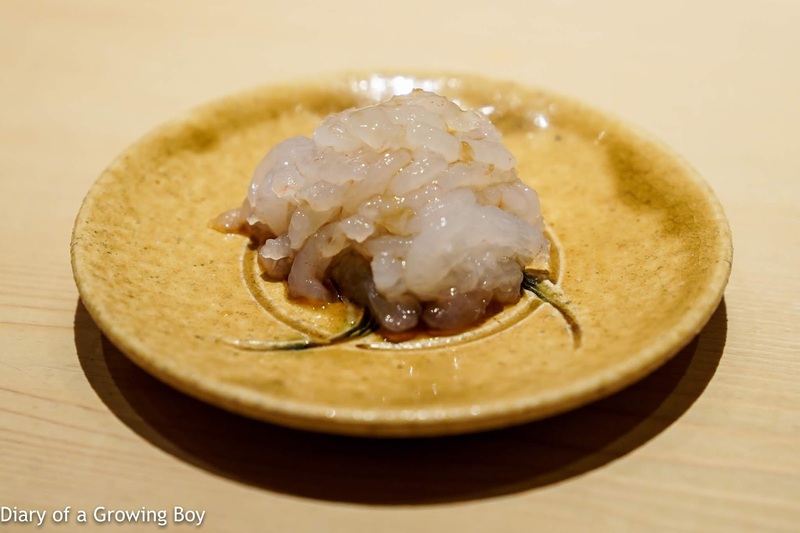 Japanese tiger prawn (車海老) - very warm and sweet, and just a little bit of tomalley to provide a contrast in flavors. 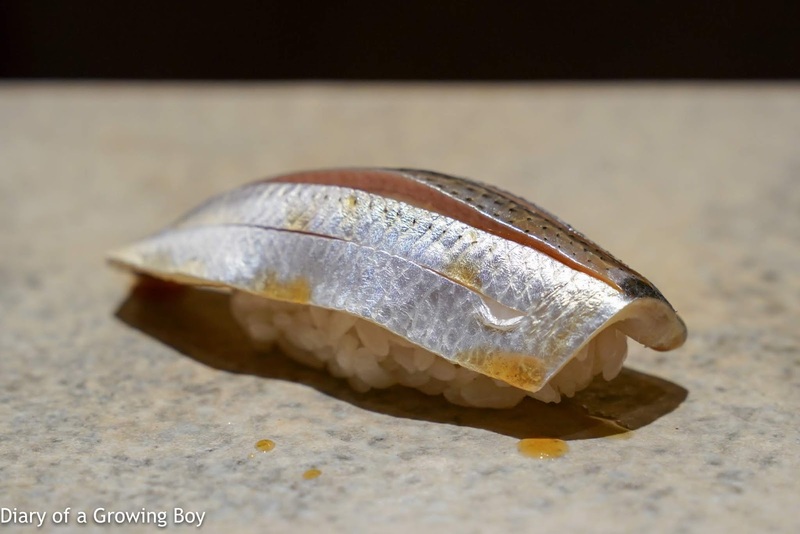 Horse mackerel (鯵) - a little surprised at the initial hit of acidity. very good, but as blasphemous as it sounds... I actually thought that the pieces made by Kobayashi-san in Hong Kong were better. 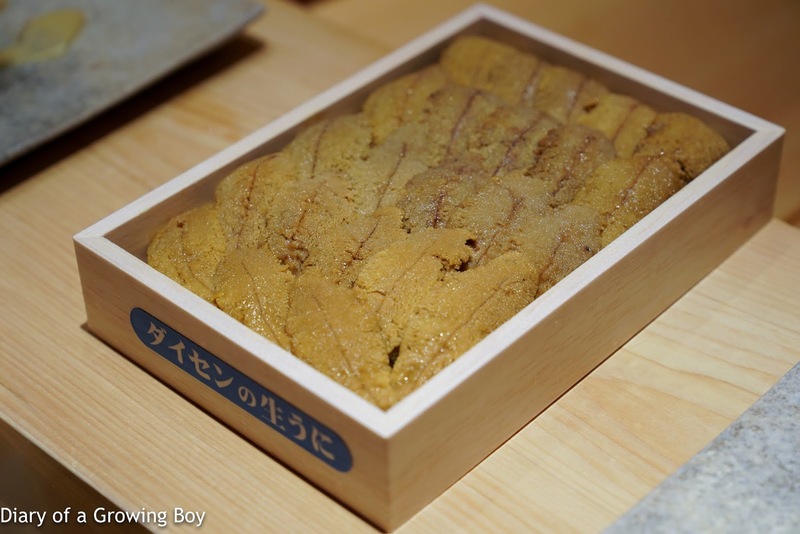 Next came a box of sea urchin from Daisen (ダイセン) in Aomori Prefecture (青森県). The color looked so interesting, because of the usual yellow or orange, this actually had a purplish and greyish hue. Purple sea urchin (紫雲丹), from Aomori Prefecture (青森県) - WOW! I thought I was eating a piece of Jell-O... So cool in temperature, and so sweet in terms of flavors. Everyone was amazed by this. 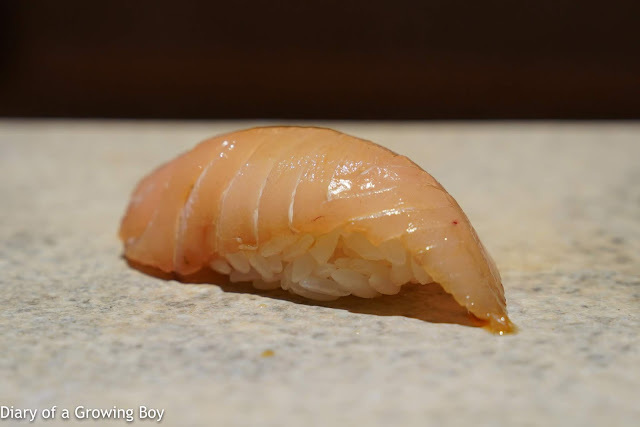 But... if I had to nitpick, there was certainly a distinct hint of hospital disinfectant on the finish so the taste wasn't perfectly "clean" and pure... as well as a tiny bit of spine or shell - which was certainly no fault of Saito-san's. 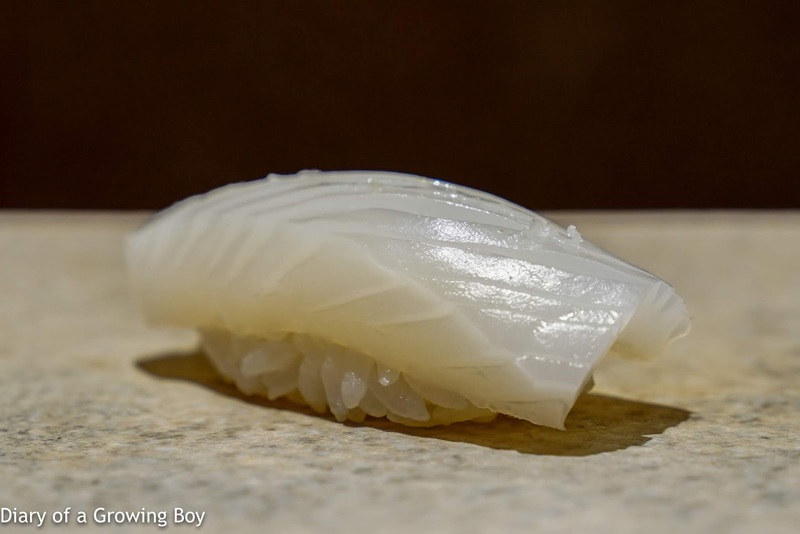 Conger eel (穴子) - very, very soft. I liked the very sweet tare (たれ), but was this a little more muddy than usual? Futomaki (太巻) - always very tasty with conger eel rolled inside, but the generous sprinkle of sesame seeds really makes this roll. 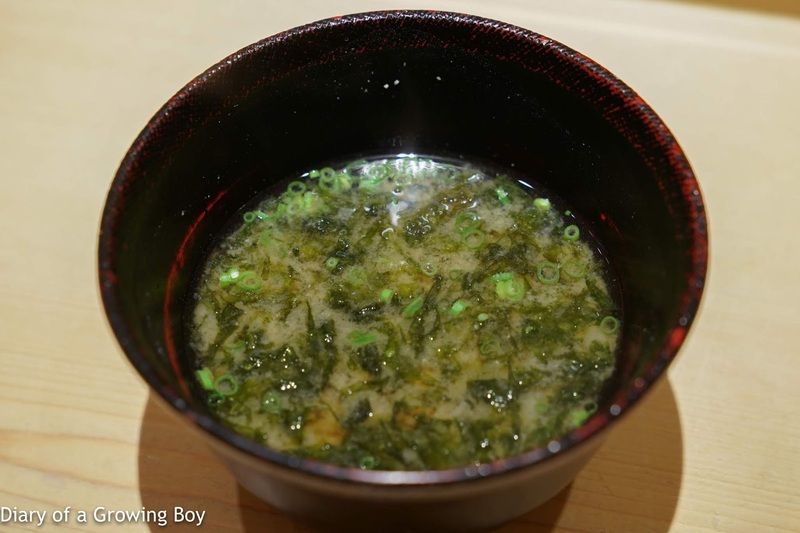 Egg (玉子焼き) - good depth of flavors here... both savory and sweet side. The golden side - which had originally come into contact with the heat from the pan - had a more liquid texture just below the surface. The Dining Austrian arrived shortly after the nigiri started coming, which became the cue to start serving the bottle I brought. 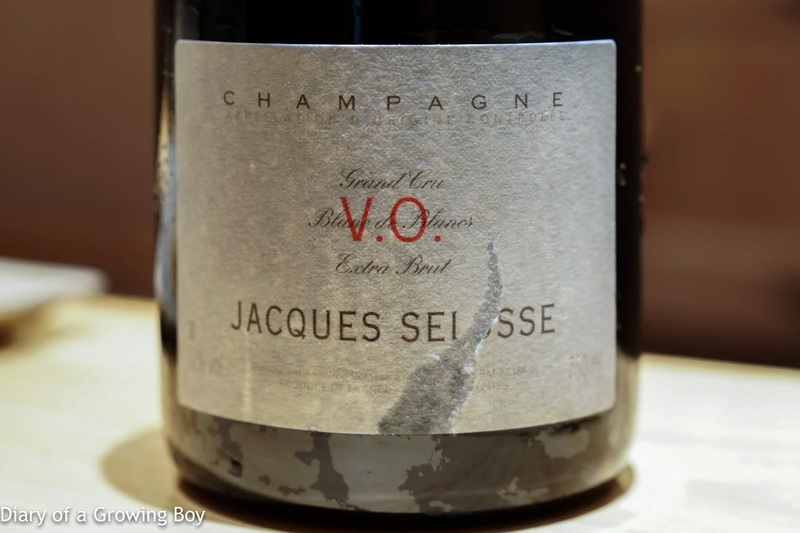 I was told that Saito-san likes Champagne, and as it turns out he really likes ones from Jacques Selosse. How lucky it was, then, that I had brought along something to his liking to share with him! I could not have been happier about my lunch today. 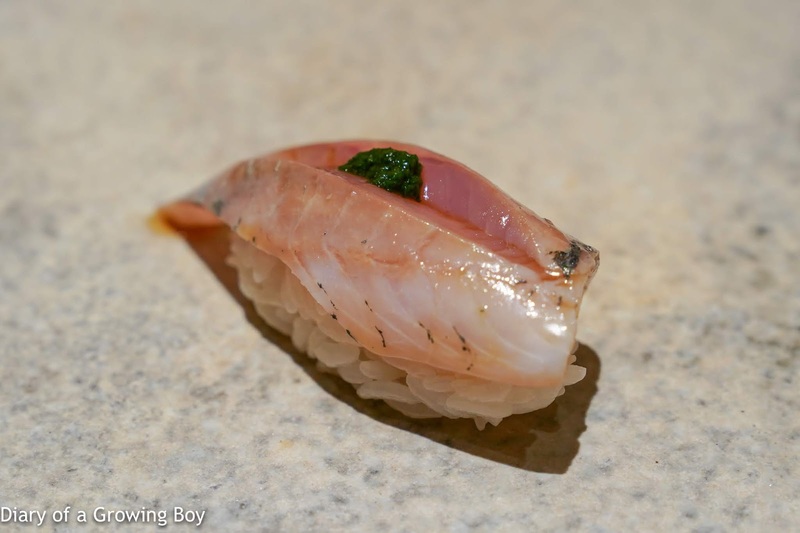 As was the case 5 years ago when I tasted Ono Jiro (小野二郎)'s sushi for the very first time, I sat down at the counter with sky-high expectations... and had those expectations blown away. 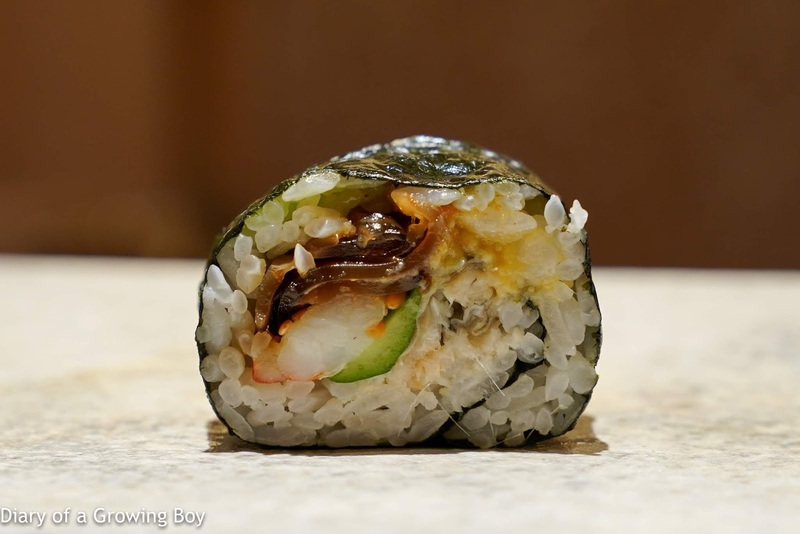 This was all the more difficult considering that I was already somewhat familiar with the repertoire from my 5 visits to Sushi Saito Hong Kong last year. There were so many fireworks at lunch today, but if I had to pick... the monkfish liver would come in a distant second to that rosy seabass. Thank you, my good friend, for making it happen. I look forward to sitting at the counter with you again in November.